LAS VEGAS – The hottest cowboy entering the fifth round of the Wrangler National Finals Rodeo was Utah saddle bronc rider Ryder Wright, who had earned wins through the first four go-rounds. Steer wrestler J.D. Struxness is trying to make that sizzling start transition to him. 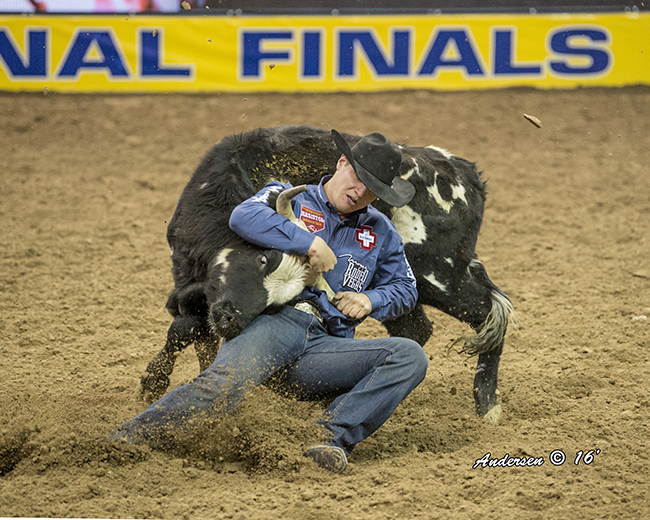 On Monday night, he knocked his steer to the ground in 3.5 seconds to win a round for the third straight night. “I’m just trying to catch Ryder Wright,” he said with a laugh. He’s doing a pretty fair job of it. Through five nights of ProRodeo’s grand finale, Struxness has pocketed $91,442; of that, $76,000 has been earned since Saturday night. He sits second in the world standings with just five nights left in the 2016 season. He has pushed his annual salary to $175,876 and trails the leader, Tyler Waguespack of Gonzales, La., by just $7,158. Struxness is more than $25,000 ahead of the No. 3 man, Arkansan Jason Thomas, but that ground can be made up in a hurry. That’s why it’s important that he remain on the roll he’s been on, and he has a solid team to which he gives the credit. Monday’s round featured the second time that set of steers had been run – each of the timed events includes three pens, so the steers in Round 5 had also been run in the second round. Each of the bulldoggers has done is homework and had a game plan for how they needed to make their run. Struxness conferred with Shofner prior to Monday’s race in the Thomas & Mack Center dirt. While he has done well in four of five rounds, he did suffer a no-time on the second night. That puts him behind the leaders with regards to the average race, where the cowboy with the best 10-run cumulative time will receive a bonus of $67,269 at the NFR’s conclusion. That seems like the perfect approach.